Standard Cancellation Policy: All bookings will be charged for the first night's room and tax at the time of booking or shortly thereafter as a deposit to secure the reservation. A full refund will be issued if the reservation is cancelled at least 72 hours prior to scheduled check-in date. A late cancellation fee will be charged of the first night room and tax if cancelled within 72 hours of arrival date. Special Event Cancellation Policy 2019: Requires full prepayment upon booking. Deposit will be forfeited if not cancelled 30 days prior to arrival date. Must be 18 to check-in. No one under 18 will be allowed to stay in a shared room. Anyone caught smoking in the building will face a $250 fee and immediate ejection without refund. No pets allowed. Accommodations are provided strictly for travelers with a valid photo ID or Passport, travel documents, and a credit card with their name on it. Maximum length of stay is 14 days, no exceptions. We do not provide any parking. We provide handicap accessible rooms, please make a note in the comments section of your reservation if you require an accessible room. 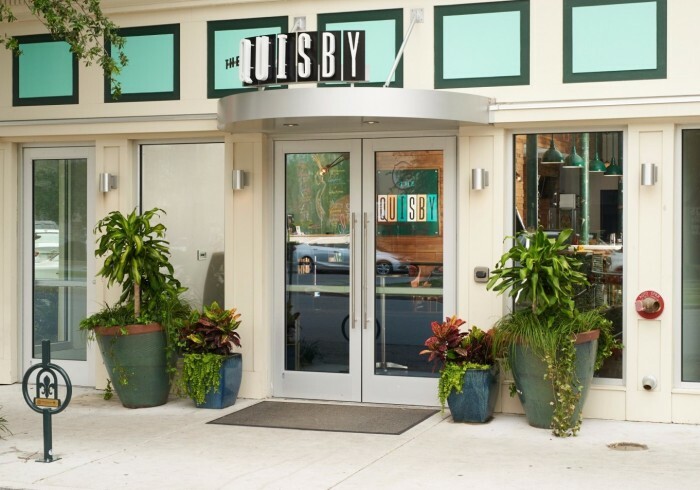 The Quisby is a hostel in the Lower Garden District. We have ridiculously comfortable beds, free breakfast, blazing fast WiFi, and a 24-hour bar downstairs. We offer private rooms, shared rooms, and female-only shared rooms. Over a dozen famous restaurants and bars are located within a half mile including Avenue Pub, Circle Bar, and Emeril's Delmonico. We are steps from the WWII Museum, The Ogden Museum of Southern Art, and the Contemporary Arts Center. The French Quarter, the Superdome, and the Convention Center are all less than one mile away. The St. Charles Ave Streetcar stops 100 feet from our front door. During Mardi Gras, all the big parades pass right by our front door. Stay strange at The Quisby, the most sought after hostel in New Orleans.